Today I was present at the Mosque in Nelson as the country marked one week since the atrocities committed in Christchurch. The turnout was phenomenal. In general terms, Nelson is pretty white, and pretty apathetic. But not today. Not about this. The streets were closed off and more people kept arriving. I managed to get a place to stand on a step out of the sun, so I could watch everyone streaming in. An armed police officer stood next to me. Nelson MP Nick Smith acted as MC. One of the first things he said was that, last Saturday when the event today was planned – the idea of linking hands around the mosque to demonstrate protection and solidarity – they hoped to get 100 people. Today, more than 20 times that showed up. To that end, he said everyone was welcome to partake in the food provided by the Nelson Muslim community – but they hadn’t planned for these numbers. 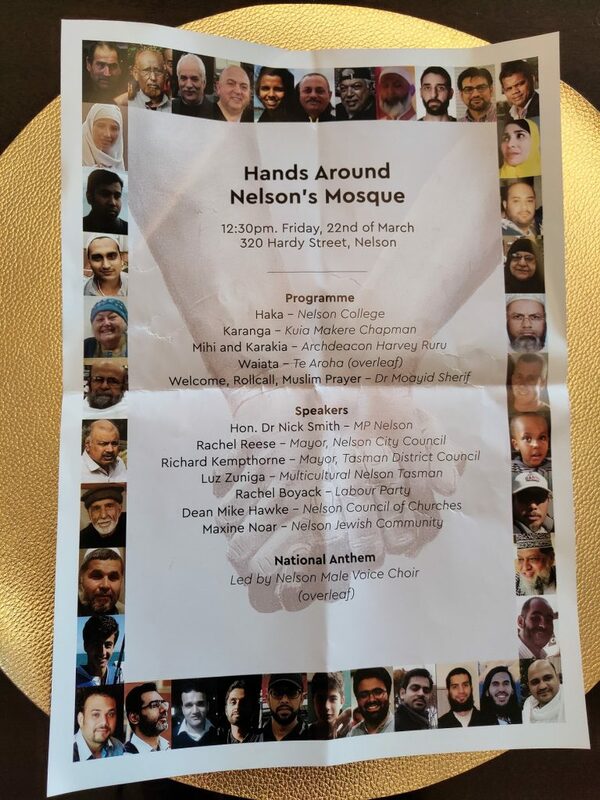 What struck me in that moment was the fact that the Nelson Muslim community had not only invited us to be part of their prayers; they provided food. Extremists and racists will have you think that Muslim people are terrorists, that their faith is about anger. It is not. I have not seen the Muslim communities of New Zealand do anything other than act with love since this horrific attack was committed against them. Members of their community, their families, were murdered by a white person. And what do they do in response? They invite us to prayer, and offer to feed us. I cannot recall the content of all the speeches made today. Our local religious leaders and our local politicians were all present. Some spoke about what New Zealand must do to ensure this never happens again. Some spoke about diversity. All spoke about love. While we keep insisting “this is not us,” – and I understand this sentiment, I do, because many of us do not want to believe this, this terrorism, represents all of us, and it doesn’t – Luz Zuniga, from Multicultural Nelson Tasman, had the courage to say “this is us.” She implored us to not let racist commentary anywhere continue, whether it’s a whole subculture or whether it’s a one-off comment from someone. She is right. If we want to be better, if we want to ensure this doesn’t happen again, we all need to take responsibility for zero tolerance. The Mosque is in temporary quarters behind the Church while the new Mosque is being built. At 1.32pm, everyone stood to observe to the two minutes of silence for the fifty lives lost. We were asked to hold hands. I went to the mosque alone so I was standing between two strangers, a man and a woman. Without hesitation, we reached for each other. I have never been part of something so profound. To be in a crowd that size, in the middle of the city, in the middle of the day – and the only sound was quiet, subdued crying. I felt my own tears roll down my cheeks and I gripped the fingers holding mine. Many of the people who spoke today talked about the grief of New Zealand. The Muslim community have their own, different, unknowable grief, but we all have it, in some form or of another. 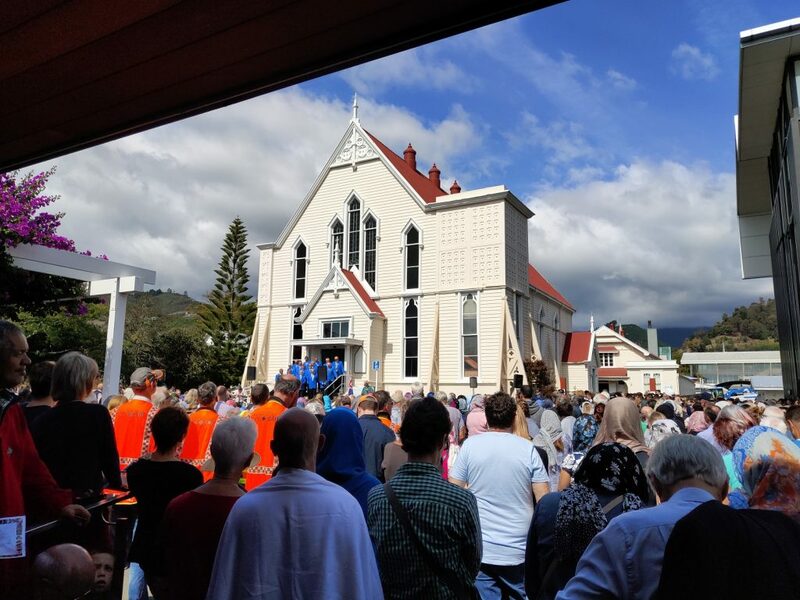 Last Sunday at the vigil someone – I think it was Nick Smith, but don’t quote me on that – said that New Zealanders think we’re a small island, disconnected from the rest of the world. That this has shown we are not. We are not a safe outcrop, where terrorism of this magnitude doesn’t exist or include. We’ve lost that naiivety. It’s what we do about that next that counts. I want to thank everyone who attended any sort of vigil, prayer, or gathering around New Zealand today. I want to thank us for standing together, for supporting those who have been attacked. That is who we should be – a multicultural nation that will stand up for any minority, who will support and amplify their voices, who will protect their right to live and practice their religion freely. I want to thank Dr Moayid Sherif, who welcomed us today, who invited us to pray, who said the names of those we have lost. May those names never be forgotten. I also want to thank the police, who were among those who got long emphatic applause today. I don’t want a militarised police force, I don’t want an armed police force, and I understand, to the best of my ability, why many people are anti-police. But they did their job last week, and they have been doing their job every day since then, helping to ensure our Muslim communities can pray in safety. I was glad for their presence today. It is hard, with the constant barrage of media about this, to know what is useful to do, what is healthy, what is proactive. It is ok to limit your exposure to need-to-know. I have taken precautions, because I know how easily I could drown, and me doing that isn’t of use to anyone. Instead I am trying to channel my response into educating myself, into actions like showing solidarity, and into supporting my friends who are taking more public roles. Amongst the mourning, there is hope. The positive thing about being a small nation is that we can act swiftly, and we can see the government starting to take the necessary steps to ensure this never happens again. I’ll be honest – I was naiive, and ignorant. I believed this would never happen here in the first place. I’m not blind or deaf to racism, I see it all the time. But I had no idea that you could even buy semiautomatic weapons here. I had no idea guns didn’t have to be registered. I was under the impression that online activity like the terrorist was engaged in was being picked up. I was ignorant, and I am sorry. I want to change that. I want to support any change that will allow our country to be what it should be – a safe place for everyone, especially minority and marginalised groups, especially those who sought and seek peace here. Today I held the hands of two strangers and closed my eyes. I listened to my city mourn. Tomorrow I will open my eyes and offer my hands to anyone who needs them. Thanks for this. I am really glad to hear Nelson event was well attended. Motueka had a small gathering in front of our small museum.